Cleaning the injection gun including all parts coming in contact with the drug or the product to be injected, should be placed in a large container such as a pressure cooker or saucepan and thoroughly boiled with with the lid on. Bringing to the boil will kill all normal bacteria and boiling for 30 minutes will ensure the destruction of most bacterial spores. After boiling, the saucepan or container should be tipped sideways with the lid on so that the water drains out. With all the water out, the syringe and the plunger may be picked up by external parts only and carefully fitted together without touching any part, which will make contact with the animal or the vaccine. Wash and dry your hands before picking up and assembling the injection equipment. What needle and syringe must I use? Generally, use the smallest and shortest needle that is suitable. 18G (green) to 21G (pink) needle. Use a syringe closest to the volume you want to inject. This will usually range from a 3ml to 10ml syringe in a goat. When giving injections always get veterinary advice to make sure the products are appropriate and you know the correct procedure. Make sure you take care to dispose of old syringes, needles and packaging in a safe place. 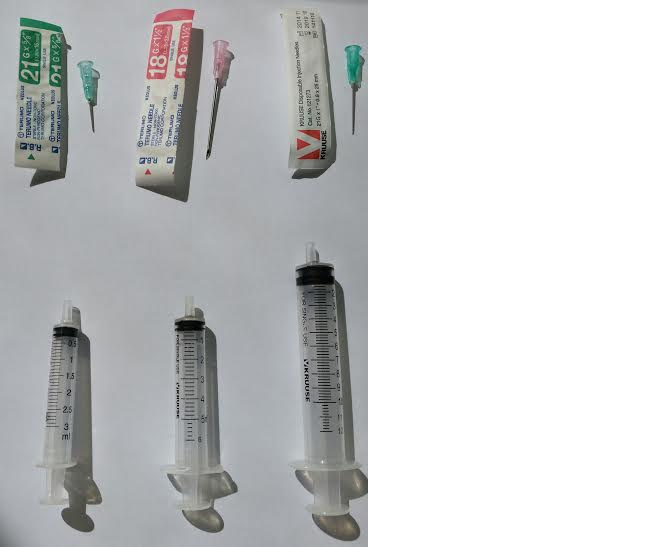 Needles are especially dangerous and should go into a special “sharps” rubbish container. Various pathogenic bacteria are present on the surface of the skin and these may produce infection if injected with the medication. Therefore, when time allows or for valuable animals, or if the environment is very dirty, take every care to clean and disinfect the skin before injecting. Tincture of iodine is satisfactory and is better than methylated spirits which though commonly used is not effective as a disinfectant - a fresh swab of disinfectant should be used for each animal. On large farms this may be hopelessly impractical. 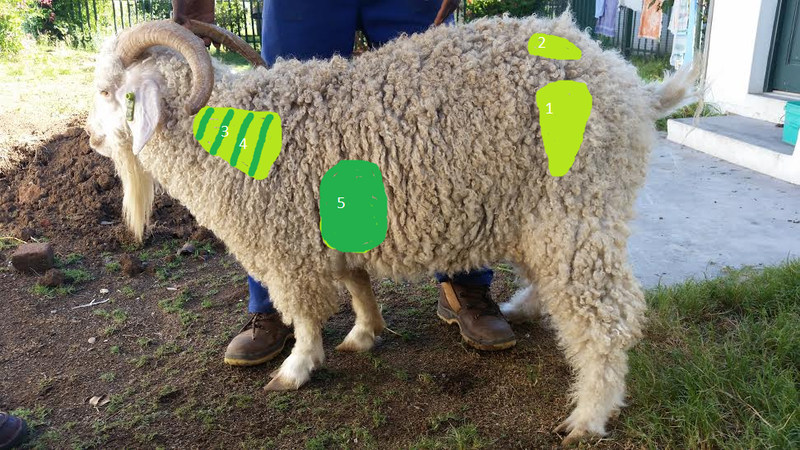 For example, if you have to vaccinate 500 ewes, you will not have time to disinfect the skin of each goat. You may simply proceed down the race injecting each goat in a clean part of the neck, taking care to keep your hands clean (and washing them if they become dirty), and replacing the needle after each race. Where do I inject an Angora goat? Thigh muscle in front of femur bone. Be careful of injecting close to the sciatic nerve running just behind the femur bone. Angora goats generally do not have much muscle mass so injecting in the biceps behind the femur can potentially lead to the nerve being damaged through the needle itself or an injection site reaction. If goats intended for slaughter for meat purposes then rather inject in the neck muscle. Gluteus muscle. Be careful to keep away from the spine. Neck Muscle. Not the area of choice as any tissue reaction may cause discomfort when grazing. 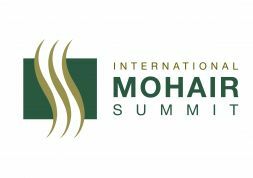 With stock held in a race to give a subcutaneous injection, pull up a handful of skin to make a “tent” and slide the needle into the base of the tent under the skin and press the plunger. Check when doing this to make sure the jet from the syringe is not coming out the other side of the tent because you’ve pushed the needle too far through. The loose skin on the side of the neck or behind the elbow is a good location for SQ injections. A 1-inch needle of 18-20 gauge diameter should be used. 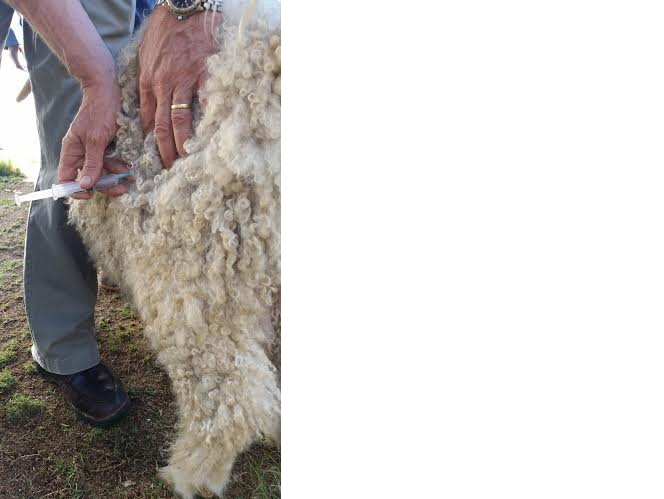 Angora goats usually do not have thick muscles and care should be taken when giving intramuscular injections. Possible intramuscular injection sites are the muscles of the neck, big muscle mass of a hindquarter. Care should be taken to avoid the nerves and blood vessels that run alongside these muscles. It is important that the injection is not put into subcutaneous fat and actually hits muscle. 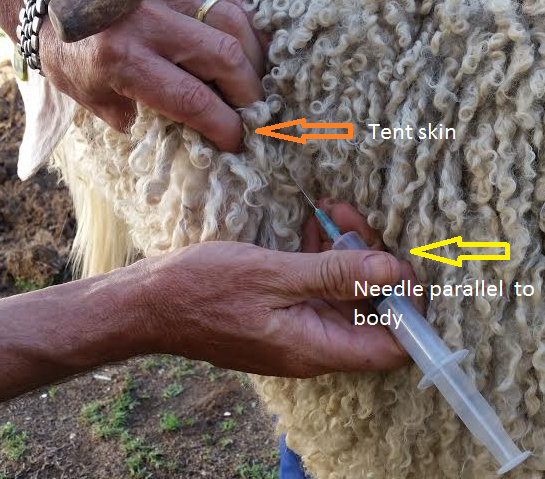 • A shorter needle than for sheep should preferably be used, especially in kids; 1 or less inches in length and 18-20 gauge in diameter is recommended for IM injections. Just before pressing the syringe plunger; withdraw it a little and if has inadvertently gone into a blood vessel, blood will show in the hub of the needle. If this happens the needle must be moved to a new site so that the injection is intramuscular and not intravenous. Avoid giving intravenous injections (into the vein) and leave them to your veterinarian, as finding a vein and injecting into to it can be tricky, especially on a goat with long hair. In goat, antibiotics for mastitis are normally given intramuscularly but you may need to give an Intra-mammary injection to get antibiotics into the udder via the teat canal. Remember the teat sphincter muscle that opens into the teat canal are very delicate structures and the teat is a very sensitive part of the goat so work gently and with care. A goat’s teat canal is much smaller and more delicate than that of a cow. It is also important to clean the end of the teat with methylated spirits before you insert the tube. Use cotton wool swabs and keep using them until they show no more dirt from the teat end. This may take quite a few rubs. If you don’t clean the teat end - all you’ll do is to push dirt and bugs into the teat and cause more problems.